For the ninth consecutive year, Applebee’s Neighborhood Grill & Bar® will honor veterans and active members of the United States military by offering each a free meal at any of the nearly 1,900 Applebee’s restaurants in the United States on Veterans Day, Friday, November 11, 2016. Since 2008, Applebee’s restaurants across the country have served almost eight million free meals to veterans and active duty military personnel on Veterans Day. This year all current and former military personnel will also receive a $5 coupon that can be redeemed between November 12 and November 27, 2016. 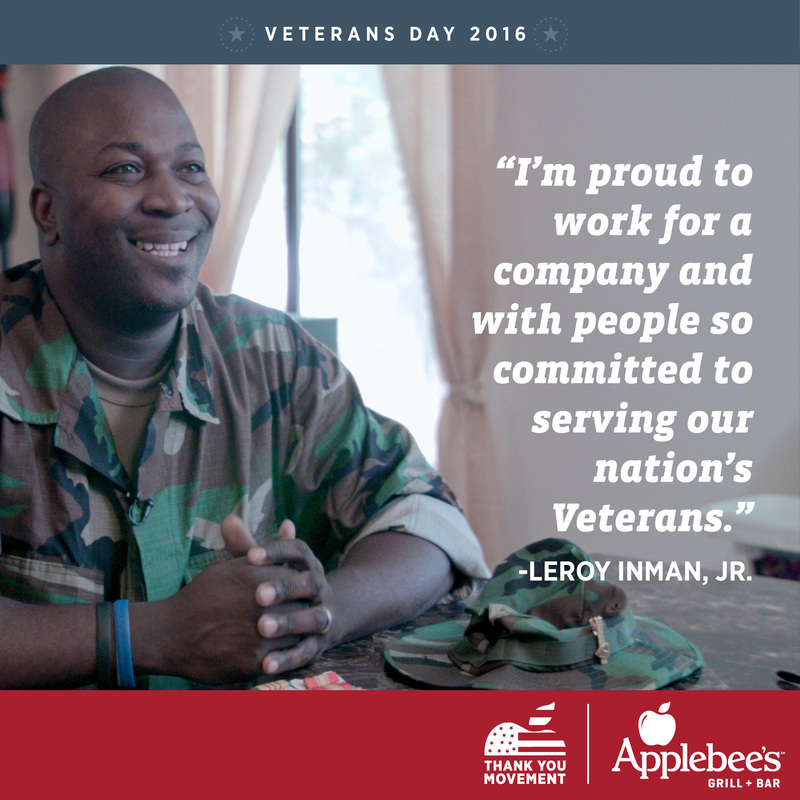 Applebee’s thanks all veterans and active military personnel for their service this Veterans Day! 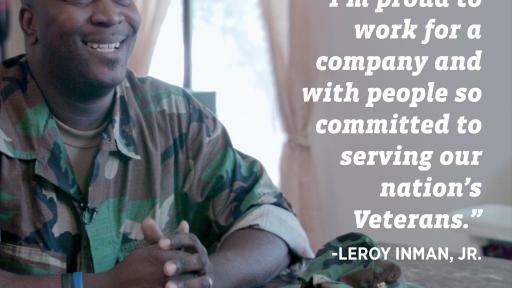 Leroy Inman, Jr. shares what Veterans Day means to him. The American Standard All-In Burger – Seared in: pickles, bacon and onion, piled on: American cheese, signature sauce. 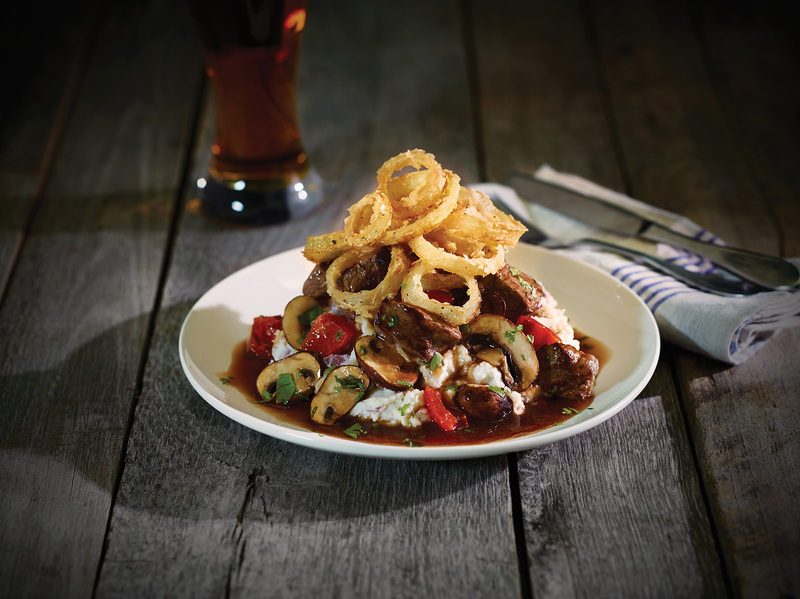 Butcher’s Meat + Potatoes – Hand-cut USDA Choice top sirloin, tomato, mushroom, stout gravy, garlic mashers and crispy onions. Three-Cheese Chicken Cavatappi – Grilled chicken, cavatappi pasta, bruschetta tomato with a Parmesan blend. Fiesta Lime Chicken® – Grilled chicken, Mexi-ranch Dressing, cheddar, tortilla strips, rice and pico. Chicken Tenders Platter – Fries, slaw and honey Dijon. 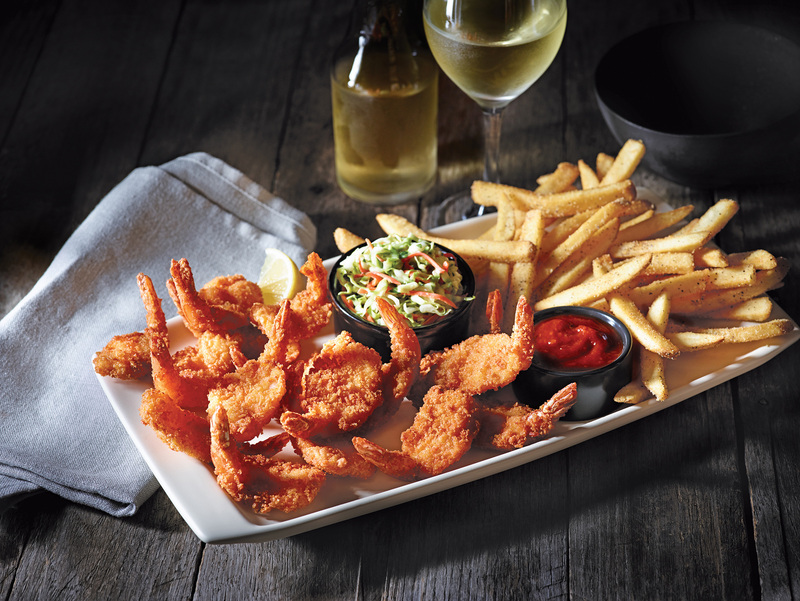 Double Crunch Shrimp – Breaded shrimp, cocktail sauce, slaw and fries. 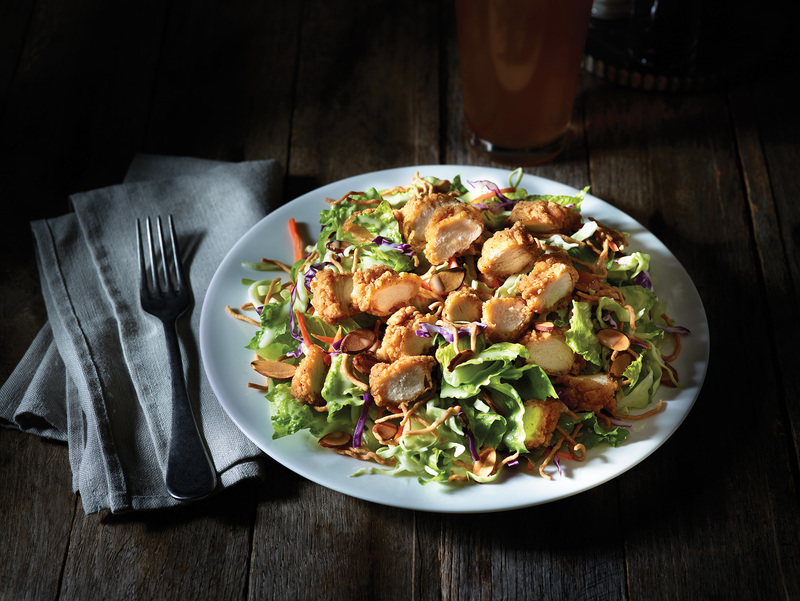 Oriental Chicken Salad – Fried chicken tenders, fresh Asian greens, rice noodles, almonds with an Oriental vinaigrette. 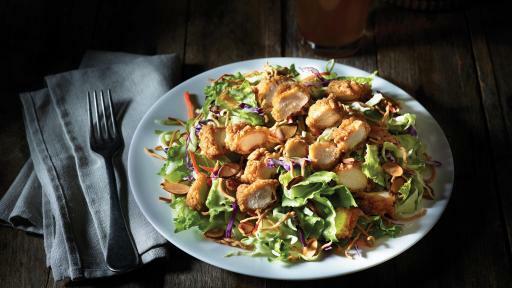 Free meals will be available at all of the nearly 1,900 Applebee’s locations nationwide. In order to receive a free meal on Friday, November 11, 2016, guests need to provide proof of military service, which includes: U.S. Uniform Services Identification Card, U.S. Uniform Services Retired Identification Card, Current Leave and Earnings Statement, Veterans Organization Card, photograph in uniform or wearing uniform, DD214, Citation or Commendation. 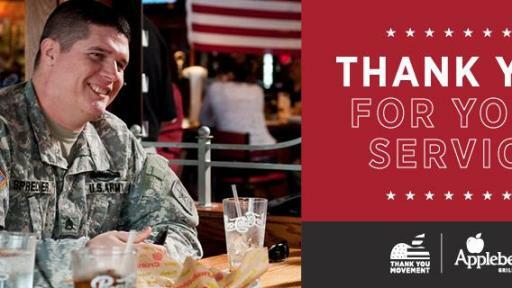 In addition, Applebee’s will again invite everyone to join the Thank You Movement by sending personal messages of gratitude to current and former Armed Service members at ThankYouMovement.com. Over the past five years, more than nine million messages have been sent through the Thank You Movement to those who have defended and continue to defend the nation. Guests can also visit the site to find their local Applebee’s. Friday, November 11, 2016, is also Remembrance Day in Canada. 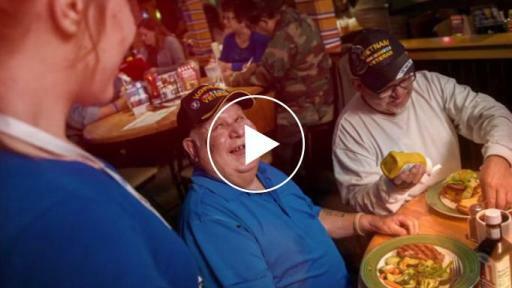 Applebee’s restaurants in Canada will be offering free meals to all Canadian active and retired armed forces personnel on this day. Offer is valid for limited menu items only. Menu selection and participation may vary. Dine-in only. Traditional sides are included with free entrees; 2 for $20 appetizers, upgraded side items or extras, beverages, desserts and gratuity are not included. Applebee’s will offer free meals for veterans and active duty military during normal business hours on Friday, Nov. 11. Hours vary by location, so guests should call their local Applebee’s restaurant in advance to inquire about specific location hours. Applebee’s encourages guests to call their local Applebee’s or visit www.applebees.com for more information. 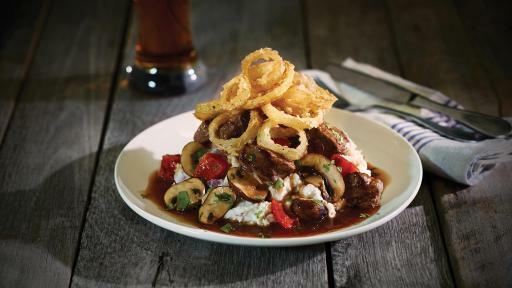 Applebee’s Neighborhood Grill & Bar offers a lively bar and grill experience combining hand-crafted drinks and simple, craveable American fare with flair. 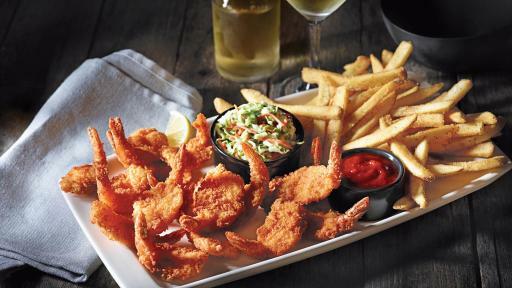 All Applebee’s restaurants are owned and operated by entrepreneurs dedicated to serving their communities and offering the best in food and drinks with genuine, neighborly service. With 1,900 locations now in all 50 states, Guam, Puerto Rico and 15 countries, Applebee’s is one of the world’s largest casual dining brands. Applebee’s is franchised by subsidiaries of DineEquity, Inc. [NYSE: DIN], which is among the world’s largest full-service restaurant companies.